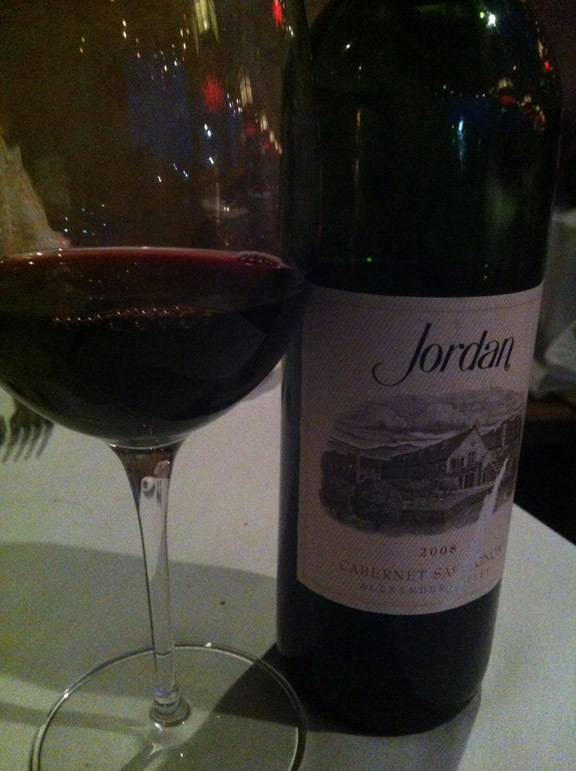 Anyway, if I could pick a place to celebrate right now, I’d go back to Fandango Restaurant in Pacific Grove. We dined there the last night of our Carmel weekend in June. The staff sat us right by the fireplace at a table for two. It was a little chilly that evening and the perfect little nook for our perfect little dinner. The restaurant was named for the dance (scroll to about 30 seconds in), fast and often furious. The “dance” at Fandango began in 1983, when a man by the name of Walter Georis decided to turn an old house into a restaurant. Among the first customers were Pierre and Marietta Bain, who eventually became the owners in 1986. Pierre was no stranger to the hospitality industry when he took the helm–his family has operated Grand Hôtel Bain at Comp-sur-Artuby in the south of France since 1737, and he had been the manager of Club XIX at The Lodge at Pebble Beach for several years. Since the Bains purchased Fandango, they have added an upstairs dining room with its own kitchen, and converted the outdoor patio into a new dining room. 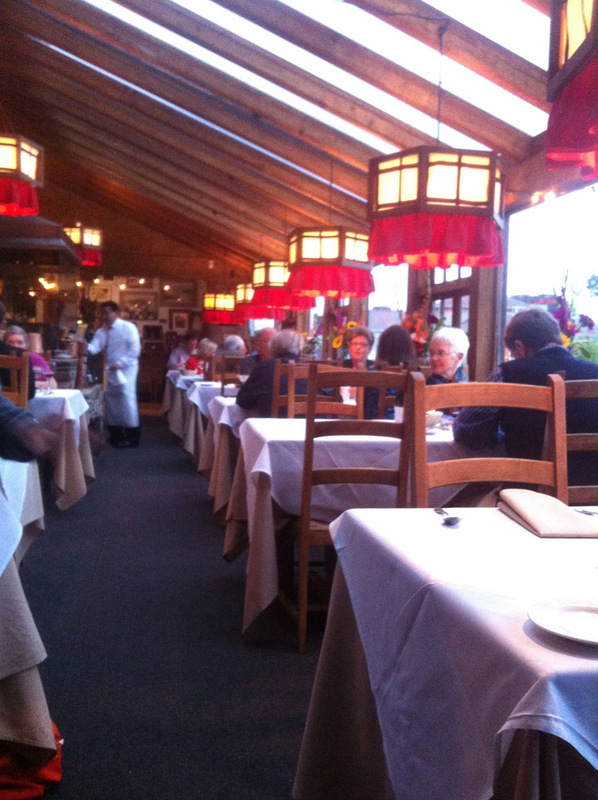 What did not change is the atmosphere, the charm of the restaurant and the classic European food. Dishes like steak frites, paella, osso bucco and duck a l’orange offer something pleasing for any palate. And what pleases my palate? 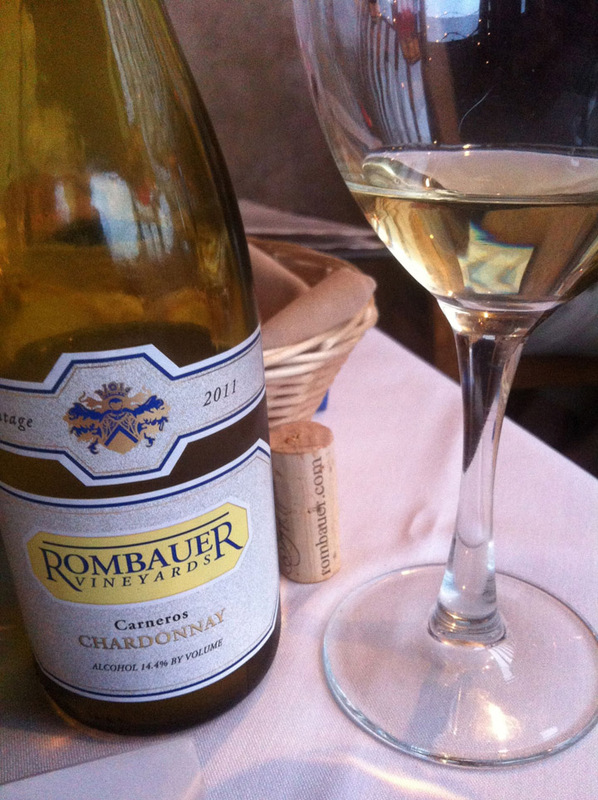 Sharing a split of Rombauer Chardonnay with my partner in crime. And pairing the wine with seared scallops. 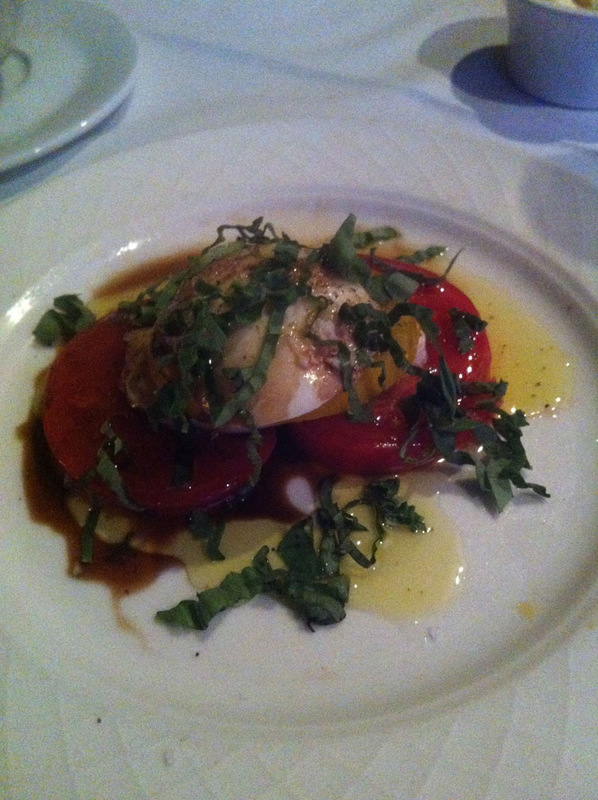 A must-have on the appetizer menu. 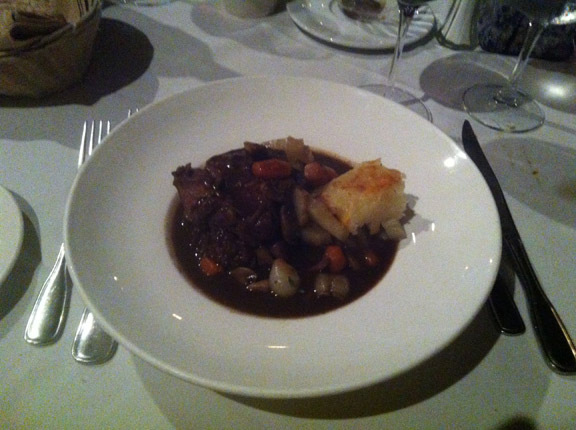 Andy ordered the short ribs, a regular menu item, which are slowly braised in red wine and served with seasonal vegetables. 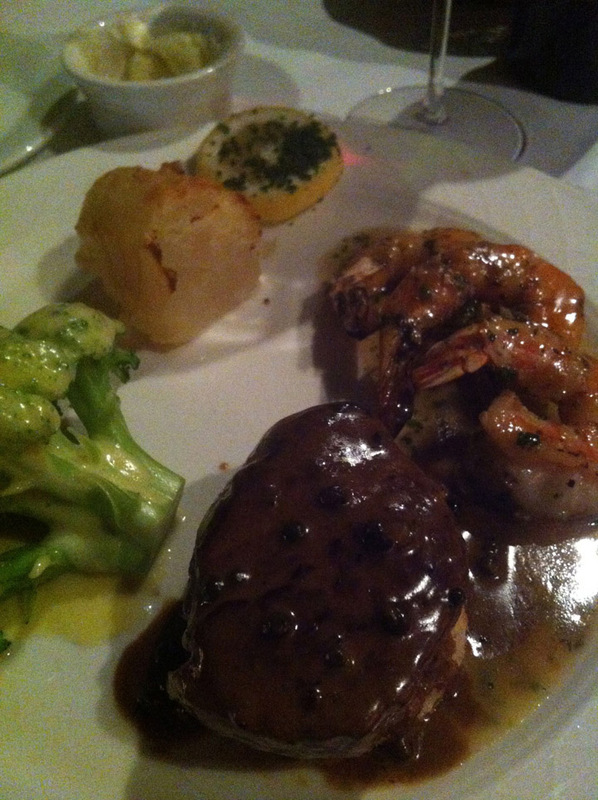 And I ordered the petite filet and shrimp duo (also a regular menu item). It was served with broccoli and scalloped potatoes. 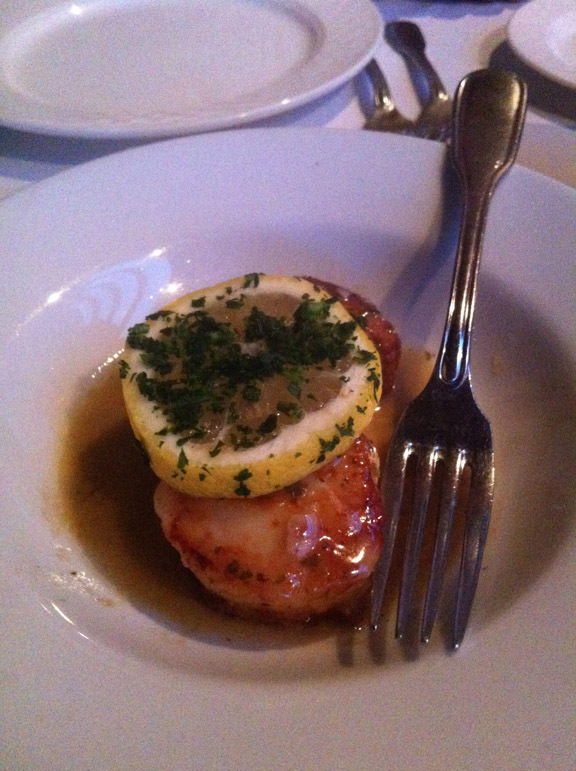 The shrimp were cooked in butter, garlic and wine (scampi). The steak was served with green peppercorn, cognac, wine sauce. I usually order a steak rare so that if it is over-cooked by a little it still comes out suitable for me at medium rare, and I don’t have to send it back. This one came exactly as I ordered it, because this is a place that handles meat and seafood with precision. 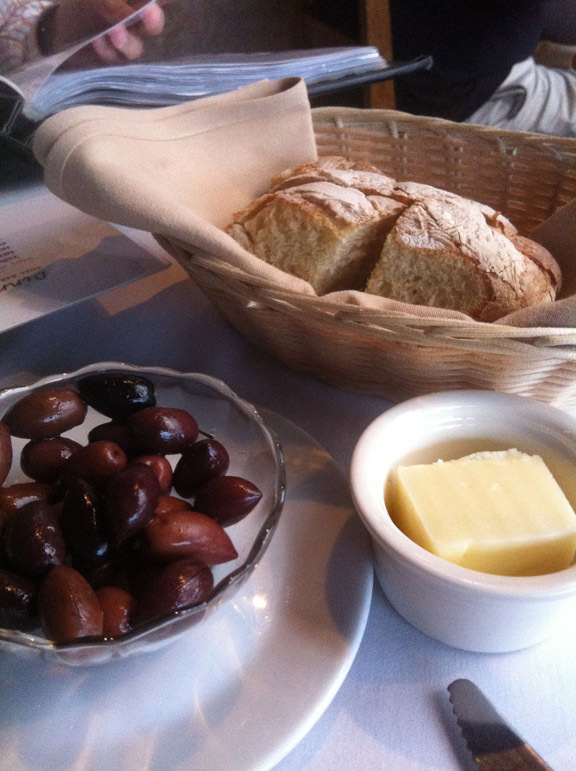 These were just two appetizers and two of many classic dishes served at Fandango. I was tempted by other selections such as the lamb shank, a cassoulet, the lobster tail and even curious to see their take on a hamburger and fries! Other less paleo-friendly selections include canneloni with veal, salmon fettucine, pasta puttanesca, spaghetti siracusa and tortellini maison. COMING SOON! Fandango Restaurant is celebrating the mushroom for the whole month of September. Pierre and Marietta have created a dish called Mushroom Provencal and are including it with soup or salad to start and dessert to finish for only $14.95. Available September 1-30 (for lunch only). This entry was posted on August 1, 2013 by cavegrrl. It was filed under Uncategorized and was tagged with anniversary, Carmel, Fandango, food, travel, wine.